I’ve had a little extra “love” hanging on after I had my little baby girl in March. So I’ve been doing more exercising lately and the kiddos have noticed. This little missy likes to kick and punch with me while I burn calories with my kickboxing DVDs. She’s hops around right along with me, flailing her arms, legs, and torso…….watch out! And this crazy monkey likes to call any sort of physical exertion his exercises. He throws something in the garbage? Exercise. He puts his shoes away? Exercise. He crawls on one knee with the other leg dragging behind him because he hurt his foot and won’t walk on it? Exercise. True story. And this baby girl of ours even does her exercises too. Thanks for letting us show everyone your moves, Baby Girl! Anyway, by animated image…….I’m talking about making a picture, where several slides of pictures rotate one after the other. So start by creating a new project in photoshop. I made mine 400×600 pixels. Then click on that little icon at the bottom of the screen to switch your project to “frame animation”. Next, open up all the pictures you’d like in your animation. Then put them into this new project, all in their separate layer. Then at the bottom in the animation area, click on that little square icon to add enough frame boxes to your animation. I had 6 pictures to use, so I added 6 frames. Then click on the second animation box, and then make sure the ‘eye’ is only showing for the next image you want to show up for the second animation slide. Continue until all your animation boxes have their own image in them. Then click on the time button below each image in the animation section. This will allow you to choose how long each frame will show in the animation. I chose .3 seconds originally, but then changed to .4 later. Also be sure that the button below the images says “forever”…….meaning that it will repeat the frames continuously. Press “play” (the triangle) below the little pictures to see if it’s how you’d like it. Click on “file”, then “save for web and devices”. A large screen will appear where you can adjust settings and such. 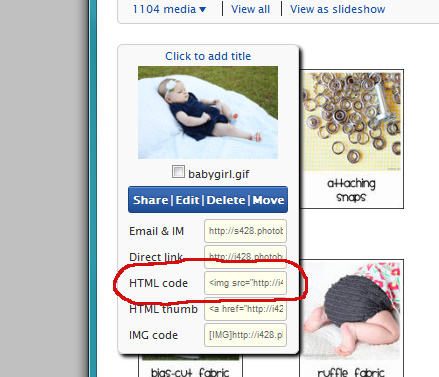 Make sure that the file is in GIF format, then click “save”. Upload your GIF file to a picture directory that you like (I use photobucket.com) and then grab the html code and add it to your post. Then post your animated image. And laugh if it’s of a 2 month old wiggly baby……doing her thing! For more cute baby videos, click HERE. too cute!!!! can't wait to try this out!!! lol!!! But totally need to do a video of my little guy while he is still little and adorable! wow. This makes me want a baby! She is adorable! Makes me want ANOTHER baby too! That video cracks me up! You are so funny! She is such a cutie! I love the video! I think I'll give it a try.. I think my boys would love it! uhhhh this is SO clever! And hilarious! AND CUTE!!! SOOOOOOOO CUTE!!! I am loving it! AH, love it! So stinkin' cute! You are too clever! That's cute! Personally I use Photoscape to make animated pics and gifs. Really easy to use and it's free! nice! very informative! I always wondered! How adorable! I see those same exact moves with my three month old little boy! super fun and adorable. You are amazing. I absolutely LOVE your work! You are really what inspired me to learn how to sew! The cute outfits and accessories you make for yourself and your kids are AMAZING! I linked you to my blog for the the versatile blogger award. Yeah, with the others–this makes them want another baby. Your lil angel is ADORABLE! LOVE those baby moves! You've gotta help us resist—make a video of her wide awake at 2:30 A.M., PLEASE, hurry!!! Haha I love it she is so cute. I esspecially love the picture of her big grin at the end. So cute! I have been wanting to know how to do this, thanks!! A-DORABLE! My nine month old loves the animated picture. She just keeps giggling and giggling. So fun! Thanks for sharing! Absolutely ADORABLE! I am excited to try it out! :) Sooo… on a detail side note… did you make those perfect little carseat strap cushions?!?!?! Hmmm… tutorial?? In L.O.V.E. with your blog- THANK YOU, THANK YOU! Yes I love making little animated GIFs!!! So fun and my kids usually love them better then the "real" movies I take of them!! I edit all my stuff with Photoshop Elements and it's a bit different to make an animated GIF in that program. I posted the way I make mine on my blog, so if you get anyone asking you for the instructions for PSE's feel free to send them over!!! That was so cute! My kids and I enjoy making animated pictures on occasion. Hilarious! So glad to know we aren't the only goons doing things like this with our children! No Way, No Way Thanks you so much for sharing I have been tring to figure out how to do this for months!!! Thank you, Thank you! I just made one of these because I was trying to capture movement as Oliver was dancing. 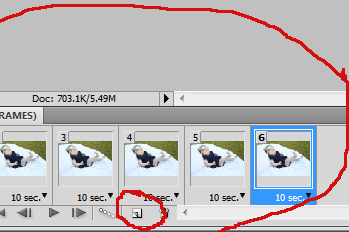 I have CS5, and at the upper right of the gray bar that says "Animation (Frames)" I clicked the little drop down arrow and there was an option to "Make Frames from Layers", which was a lot easier than your way with so many pictures. I'm not sure if that option is in CS4 though. In the Photoshop CS6 the animation replaced by Timeline. Please update it so other know it. before frustrating. What a great post! I had been wondering how do animate an image. Thank you for posting this!